The Seaview walk is based on an old railway roadbed. 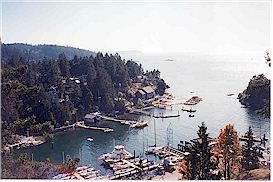 It's a level trail, approximately 1.2 miles in length with beautiful views of Fisherman's Cove and the harbour. Nice flat walk that's perfect for small children, seniors, and wheelchairs. Located off Marine Drive, just opposite the Glen Eagles Golf Course. Park in the free lot opposite the golf course, and the walk starts at the east side of the lot. For information call (604) 925-7000.